By Dennis W. Viau; modified from a recipe in a book. The name and author of the book from which I got the idea for this smoothie will remain nameless (for shame). If you’ve cooked often enough, you know some recipes cannot be trusted. The author thinks the idea is a good one, but never tests it. This smoothie needed liquid. I added orange juice. 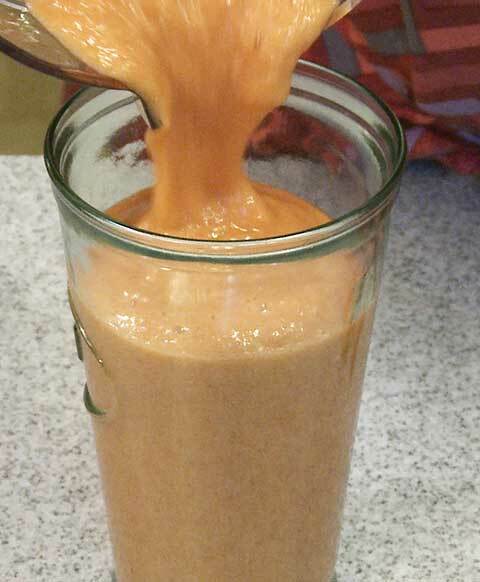 Combine all the ingredients, in the order above, in the jar of a high-end blender such as a Vitamix. Start blending at low speed and slowly increase the speed to high. Blend about 40 seconds or until smooth.